Back in 2012, the excitement levels for Ridley Scott’s return to the science fiction horror universe of Alien was, for me, off the scales. I couldn’t wait. Anticipation was far too much. Sadly, I was brought down with a crushing blow as Prometheus failed to deliver the thrills and spills that the 1979 classic gave us, instead of going down the route of pompous and pretentious. Now, some five years after, Scott, having listened to all the criticism of his first prequel, has come back with guns a blazing. Admittedly I did go in with very low expectations this time. They were exceeded massively. 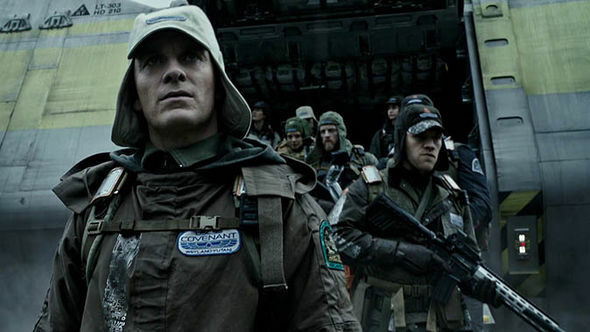 This is the Alien film that Prometheus should have been. Spacecraft Covenant is heading to a planet to start a colony. On the way, they pick up the sound of, what they believe, is the voice of a human on another planet that is habitable. Sending down a small crew, they soon discover a virus that transforms itself into an alien life form. Under attack fro such a creature and now stranded after their shuttle is destroyed, the remaining crew members are saved by a mysterious figure…David, the humanoid, who had survived the events of Prometheus and now has a plan involving his newfound survivors. Scott starts his new film off with a bit of exposition about who David is and where he came from. In this pre-credit scene, my heart sank a little as it seemed we were heading down the same road that Prometheus had set up. Thankfully this sequence is short and we move swiftly to the new ship, Covenant, in which the crew is in hypersleep and the craft is being looked over by computer Mother and humanoid, Walter. An exciting, if tragic moment occurs and then the film is truly off and running. Once the crew hit this uncharted planet, the shocks, gore, and tension begin to rack up. Scott is a master of piling on the suspense, as proven in the original Alien. Considering that film was nothing more than a slasher horror set in space, where the killer just happened to be a giant, man-eating monster, Scott managed to make so much more out of it and delivered a priceless horror masterpiece. Here, he returns to those heady days with great aplomb, dropping scenes of pure terror while making the tension almost unbearable. Gone is the whole meaning of life stuff (even if the explorers from Prometheus do make a brief return in a flashback) and back in are the chasing down corridors and “what in the shadows” terror. It is also very, very grisly in places, as the creature (s) pick off their victims one by one. (So much so you question if the 15 certificate isn’t strong enough). What really works this time is that get to care for the characters. Prometheus had an interesting cast but the characters seem sketchy and so you didn’t really feel for them. This time round, you are right behind Daniels, the female officer who has to face both her fears and heartbreak. The performances are very solid. Michael Fassbender gets to really enjoy himself playing both new humanoid Walter nad his former creation, David, sometimes together in the same scenes (Ever kissed yourself? Fassbender can say he has). 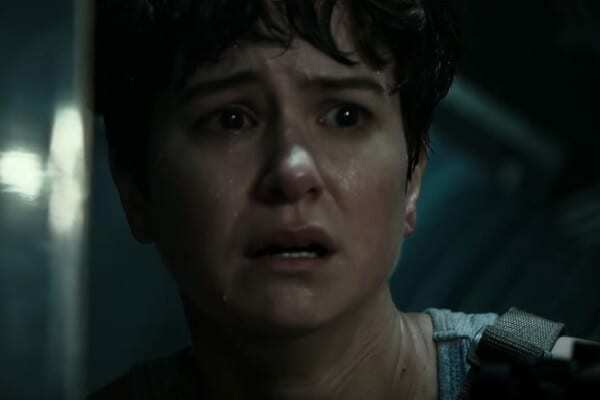 Katherine Waterston valiantly takes on the female action hero and while she may look mild and meek, she certainly doesn’t mind throwing herself into the role of Daniels. Nice to see Danny McBride playing straight for a change instead of goofing around. The real star is Scott, proving once again why he is one of this country’s most highly regarded directors. After loosening up with the light-hearted The Martian, Scott triumphantly returns to the genre that made his name and this time he hasn’t disappointed. While this might not be up there with Alien, it miles more entertaining than Prometheus and as an out-and-out horror, makes some of the more recent shockers look like kiddies bedtime stories. Alien fans will love it. We are certainly back on track.